H. Stern, a Brazilian jewelry manufacturer with many retail outlets in Israel and an international presence sells a finger ring. 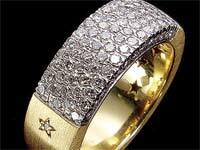 The ring is a flat gold band with a diamond encrusted oblong section and the rest of the band being polished to a mirror finish. The band is also decorated with a pentagram or Seal of Solomon on the shiny part on each side of the diamond oblong. 5 pointed stars are also engraved on the inside of the band. The ring is known as the Juliana model. Aryeh Pozylov, through various companies including Orneal LTD, Nitfaz (a pun on nitfas, i.e. snapped up) and Pozylov Diamonds marketed a somewhat similar but substantially cheaper ring which has Star of David (Magen David, or Hexagram) decorations. The pentagram is a registered trademark for H. Stern, chosen since Stern means a star. Although the products under consideration are rings in both cases, since H. Stern does not sell via third parties, there is no real likelihood of confusion. Finally, Judge Drora Pilpel applied the fourth part of the triple test, the so-called ‘clear thinking test’, and decided that even though the sound of the mark was different (the ringing of the ring? ), since the conceptual idea between Stern’s mark was to imply the maker, using a star (Stern being German for Star) as a maker’s mark, whereas the defendant’s Star of David implies made in Israel, there was no likelihood of confusion. As to whether the trademark of the pentagram was well-known, Judge Pilpel related to the issue at some length, which is surprising, since she has already decided that there is no trademark infringement. Nevertheless, she decided that it wasn’t, despite the complainants remonstrations to the contrary. The judge acknowledged that the plaintiff had a reputation for the Juliana design and that it was associated with them to some extent, but did not think that the public would be confused as to the source of the goods since H. Stern only sells rings in their own shops. Having recognized copyright in the combination of the three design elements, the judge went on to rule that the fact that one ring had hexagrams and the other pentagrams were not significant enough to alter the fact that the defendants ring was a blatant copy. Since she had found copyright infringement, the judge considered the question of unjust enrichment irrelevant. As to dilution and stealing reputation, the court threw this out for lack of proof of damage to H. Stern. In conclusion, the judge found statutory damages of NIS 20,000 under the Copyright Ordinance of 1911 that was in force when the case was filed, and in the alternative, found that the plaintiff would be entitled to profits made by the defendant from the infringing rings. The judge also awarded NIS 40,000 costs. Finally, the judge ordered the unsold stock of rings and the molds to be destroyed and for the defendant to cease advertising or selling these rings. Had the plaintiff filed a design registration they could have got an injunction and enforced their rights more simply and quickly. The honorable judge apparently has little idea of how to apply the so-called triple test. The test of the sound and appearance of a trademark has relevance for a word mark, where goods are chosen by sound. The fact that Pentagram and Magen David sound different is totally irrelevant. The only question is whether the pentagram is recognizable as a trademark when applied to the ring, and whether the hexagram is confusingly similar. If the mark is seen as part of the design or the two marks are considered as distinctive in context, then there is no trademark infringement. If, however, the marks are confusingly similar, then there is trademark infringement. The fact that the word hexagram has two identical syllables as pentagram is totally irrelevant. I suppose it would be churlish to point out that neither of Stern’s registered trademarks is actually for a single pentagram. Stern’s Israel trademark registration number 170325 is for a five pointed star, not for a pentagram at all. The stars on the inside of the band are a registered trademark, the pentagram on the outside with a diamond in it, is not. Does Stern use the pentagram on all their jewelry? Is the symbol widely used by them on the reverse of pendants, bracelets and rings? If so, it may fairly be considered as an unregistered trademark. Otherwise, it would probably be considered a design feature by the purchaser or the receiver of the gift. Only if it can fairly be considered as being a trademark at all, is the issue of whether the hexagram mark is confusingly similar. In this regard, the hallmark for Britannia grade silver (95.84%) is a leopard head or a lion head erased, or, since 1999, with the number 958. The UK sterling silver hallmark is a lion passant. Sterling silver in Israel is indicated by the number 925, and Russian Silver by the number 880. These numbers and hallmarks are indicative of the relevant degree of similarity for trademarks in this field. I am not a judge. The right honorable Ms Pilpel is. She should, however, apply her judgment to relevant issues. As to the issue of Stern only selling via their retail outlets, the point has some relevance, but would the receiver of a gift know where it was bought? Is jewelry never sold second-hand? The clear thinking test was anything but. The judge really meant to say was that the purchaser would consider the Magen David a design element, not an indication of the source fo the goods. Therefore there was no trademark infringement. No design was registered, and therefore there was no infringement. As to copyright, in Israel although the design law which dates back to the British Mandate is sorely in need of revising, there are no unregistered design rights. Any mass-produced article is protectable as a registered design and is protectable for up to 15 years. By allowing copyright protection for such goods, presumably for life of the creator + 50 years, why would anyone register designs? Since H Stern’s ring was designed for mass production, there is no copyright. That said, having wrongly established copyright the judge was correct in seeing it infringed by the defendant’s ring. I am also unimpressed with the judge seeing copyright in the combination of three design elements, since H. Stern had argued that the pentagram was a trademark and not a design element. This should have estoppeled them from claiming it was part of the design, and with just the polished band and diamond oblong bit, Stern’s ring would not be sufficiently distinctive to attain copyright protection even if copyright applied, which in this case, under Israeli law, should not. It is a shame that the judge found it superfluous to rule on unjust enrichment because one assumes that the finding of copyright infringement would not stand up in court. Following the high court ruling in the A.Sh.I.R. case which is good legal precedent (even if arguably a poor decision), there are grounds to apply the Law of Unjust Enrichment where designs were not registered, if there is evidence of bad faith. In this case, I am not sure that there are grounds, since I see this as an unregistered design in the public domain, nevertheless, think the judge could have been more thorough. ‹ Alexandria – Health Science; not health related nor scientific, but so what?